Jack Baldwin is a transfer target for Sunderland. Peterborough United will make summer signing number 10 on Monday (July 2). 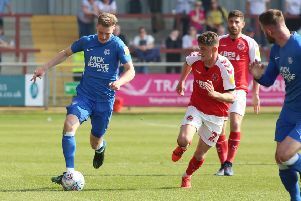 Chairman Darragh MacAnthony revealed on his Twitter account this afternoon (June 29) that a centre-midfield player who could also play at right-back was at The ABAX Stadium this morning and the paperwork for a loan deal would be completed on Monday. He also added that a centre-back would be joining the club next week as well. MacAnthony also stated that he expects half a dozen players to be moving in the opposite direction early next week. Sources in the North East are confident one of those will be Jack Baldwin signing for Sunderland for a fee in the region of £250,000.